Student sizes can be entered directly into Jackrabbit or recorded on a Measurement Worksheet to be entered into Jackrabbit at a later date. A student's girth must be entered for Jackrabbit's Costume (Apparel) Auto-Size feature to work properly. Click the Sizes / Measurements button. In the Student Size Entry window, enter sizes for each student. Open the Student record and click on the Sizes tab. 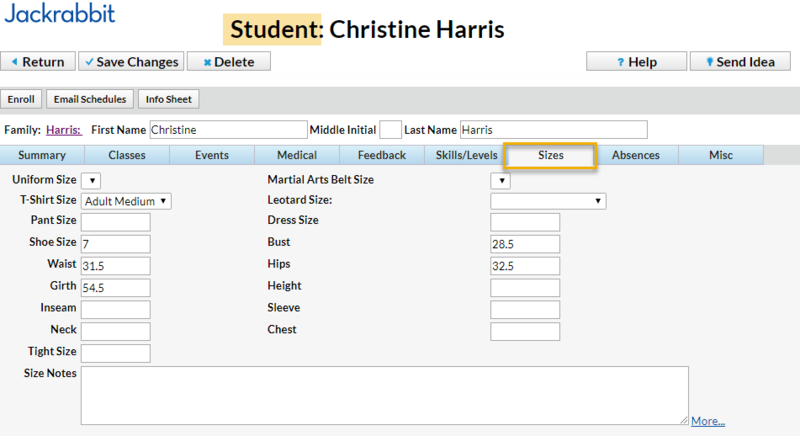 Enter the size information you have for the student.